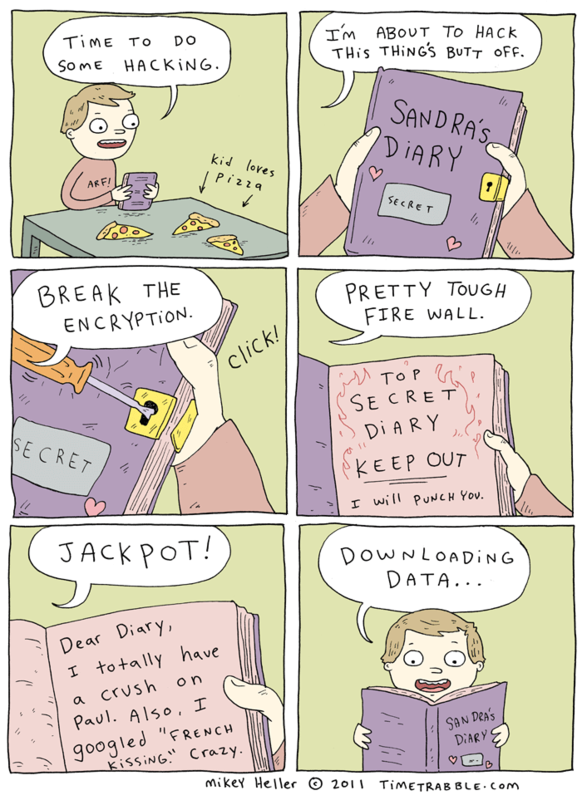 This comic also involves BOOKS! Reading is a lot of fun. Can you imagine how much fun it would be reading on a roller coaster? That’s probably so much fun. Do you guys like Twitter? I invented it. My Twitter Web-page. I also invented Formspring. Like for a school project. I got a B+. Thinking of making a shirt. People like shirts. You should make a shirt so I can think about buying it. You SHOULD make a shirt. AND sign it… for me. People want you to write words on their clothing. I would like a t-shirt please! Sign it to please. As a Sys Admin I approve of this comic. This is not hacking. Hacking is on a computer. I would buy a shirt of that last panel. Ahah.